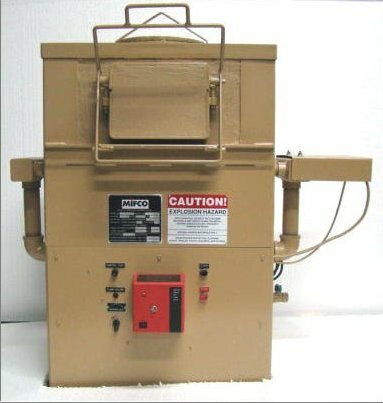 The MP47 forging and melting furnace was designed in response to requests by instructors for a small furnace that could provide instruction in all phases of hot metal working. The MP47 is used for Forging, Tool Hardening, Pot Hardening and Melting, and as a Crucible Melter capable of melting non-ferrous metals quickly. The MP47 furnace is ruggedly constructed and is designed to withstand many years of use. The steel shell is lined with our High Alumina fire bricks and high temperature castable cement. The burner system has automatic spark ignition and continuous flame monitoring by our Ultra-Violet Combustion Safeguard System for the ultimate in operator safety. MP 47 41/2" X 71/2" 7" X 17" approx 6" X 12" No. 10 8" dia. 10" deep approx 8" dia.